One of the memories I have as a kid were of the days, my mom waiting on Sunday early mornings for the fish vendor, who used to sell fish and prawns on a bicycle. All the ladies from the neighborhood coming to him and the bargaining, the early morning gossips etc. I used to sit and watch while the fish vendor washed and cleaned the fish and prawns. 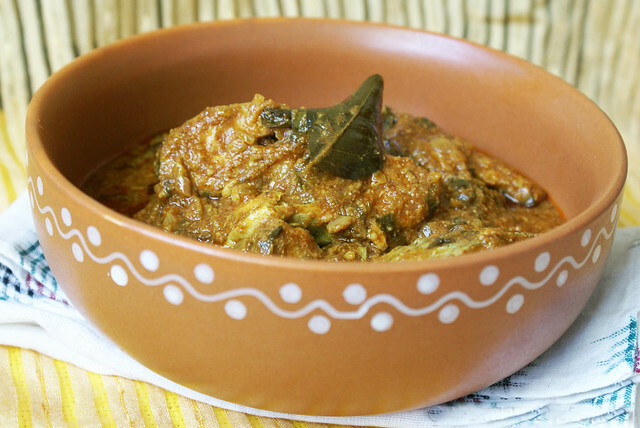 My grandmom makes the best fish curry I have ever tasted. From the time I started cooking I tried my grand-moms recipe, but always something or the other used to go wrong. I always used to get confused about the amount of tamarind used, my dish used to be too tangy or very less tangy.. 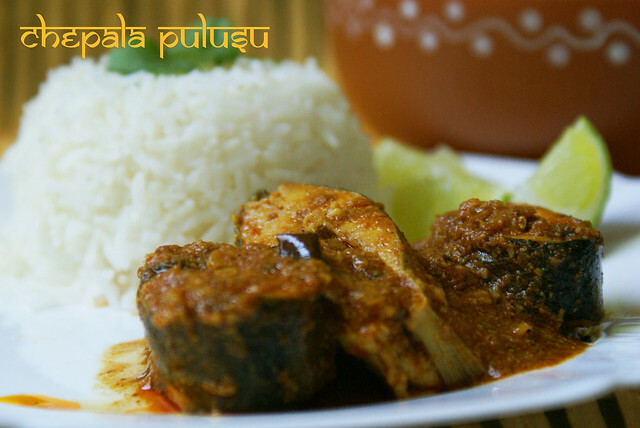 The authentic Andhra fish curry/pulusu is made using only tamarind sauce. In my version I mixed tomato pulp and tamarind for the gravy. This was very much liked by both my men. Tamarind : size of 1 large lemon, soak in warm water and extract juice. Add 2 Tbsp for the gravy. Remaining powder can be stored for future use. Add oil in a wide bottomed large pan. Add onions, curry leaves, ginger garlic paste, turmeric. Fry till raw smell from onions and GG paste disappears. Add prepared masala powder , red chilli powder and salt.Mix well. Add coconut and poppy seeds paste. Fry for another few mins. Layer fish pieces side by side. Reduce heat and cover and cook for 5 mins. Turn the pieces very carefully and cook for another few mins. Now add tamarind juice and tomato pulp. Close and cook till oil floats on top and raw smell of tamarind disappears. Do not mix with a spoon. But gently move the fish pieces or rotate the pan to mix. Adjust salt if required. Add coriander leaves and serve hot with Steamed white rice. This curry tastes better the next day or after two days. Mom advices to use Fresh water fish for better result. Add poppy seeds in the mixer and grind for a min, add a few Tbsps of water and grind again.It takes around 10 mins. Then add coconut and grind well. Add water if required. You can store this in refrigerator for 2 or 3 days. I am a seafood lover .. and with that tamarind sauce.. YUMMM . I am drooling out here looking at those photos. I will give this a try. Good that I found you and thanks for leaving a comment. I can relate to this post and though the flavors are entirely different than what I grew up with, this sounds lip smacking good! wow!! what an inviting picture..will defintely try this one.. love your serveware too..
i followed ur sherwa recipe in eenadu magazine.it was very tasty.thanks alot! Thank You for trying Bharathi. I am happy to know that you liked it. What fish have you used in this recipe? 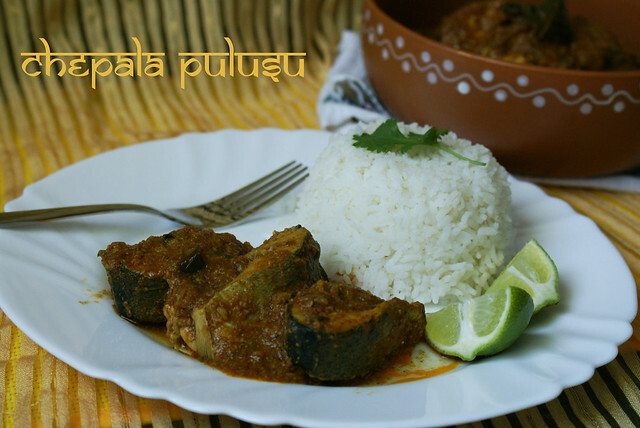 You can use any fresh water fish, like Catla or Hilsa fish. Kindly Check your site font color. nothing is visible apart from images… all i can see by using ctrl+A. your site is good bt font color is killing.